Established in Southport since 1996 providing a comprehensive service from our 2 premises in Churchtown and Ainsdale, delivering from Tarleton, Hesketh Bank, Crossens and Banks to Birkdale, Hillside, Formby and all the surrounding area. We understand the importance of a fresh floral gift, delivered with dedicated personal care, whether your gift is for a birthday, anniversary, new baby, maybe a new home. 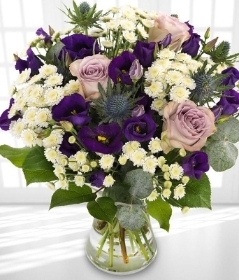 a welcome bouquet or sympathy arrangement for a funeral we will deliver the perfect gift. You may prefer your flowers to be traditional, modern, contemporary or your own design or simply allow us to create an elegant design to delight a loved one. Perhaps you would like to enhance your flowers by adding a little extra...a teddy, a soft cuddly toy,chocolates,balloons,glassware or a hand made personal gift card. In partnership with eFlorist we offer a selection of floral gifts for delivery nationwide and international. Whatever your floral needs you can either order on line, telephone or send an email to bloomincrafty@googlemail.com to arrange a delivery or collection from the shops.